It was his last day as a slave laborer. The re-building of the Pantheon was almost complete, and his debts finally paid. This place had been his home for the last 10 years, it was worth one last look. 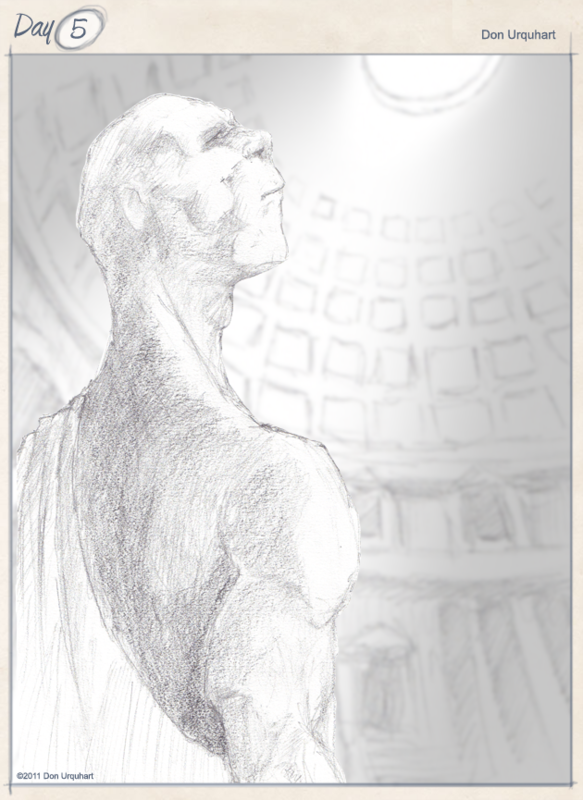 Some good old fashioned pencil work- I like the perspective of the dome, and his shading, too – it’s very light shading all around, but that makes it feel like a memory, or like the whole scene is made from marble, you know? Ooh, this is beautiful! (I don’t know from technical details. I just know I love it.) The way his face is turned to the light, and the expression on it… just gorgeous.